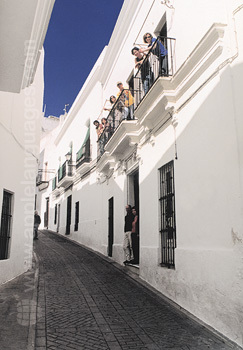 Vejer de la Frontera is an incredibly beautiful Andalusian village with traditional whitewashed houses and narrow, winding streets, which is completely unspoilt by international tourism. Located at the top of a hill, Vejer has spectacular views over the surrounding countryside and coastline, and on a clear day it is even possible to see the coast of Morocco! The nearby beaches at El Palmar are considered to be one of the best surf spots on the Atlantic Coast, and the wide sandy beaches are ideal for surfing beginners and more experienced surfers alike! 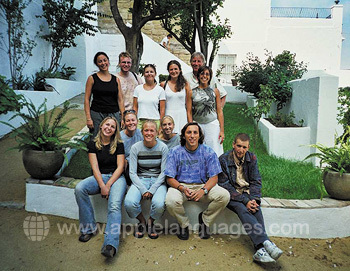 Our Spanish language school in Vejer de la Frontera is situated in a beautiful historic building, just minutes away from the town square which is lined with palm trees and has a quirky fountain where ceramic frogs squirt water in the air. The school building has 8 classrooms, many with superb views. 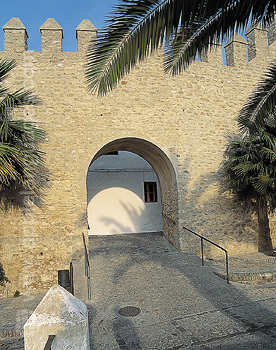 The school has a computer room with free Internet and wifi access for students, 2 interior patios and wonderful garden with orange trees and jasmine, as well as a roof-top terrace with spectacular views over the surrounding countryside. 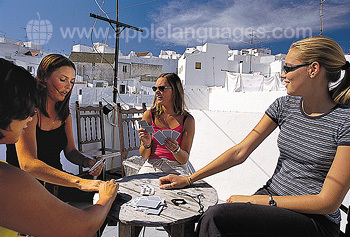 The school has a friendly atmosphere, which helps students to relax and enjoy their time in Vejer, and many return here again and again. You can learn Spanish on an 'Intensive' Spanish course (20 lessons/week), or else on an ‘Super Intensive’ Spanish course (30 lessons/week). Our school also runs a very popular ‘Spanish and Flamenco’ course, combining 20 Spanish language lessons and 3 flamenco lessons each week. Our Spanish & Surfing course combines 20 Spanish lessons and 3 surf lessons each week. Surf lessons are held at the El Palmar Beach and transport to and from the beach as well as surf boards and wetsuits are provided. 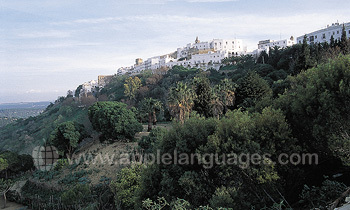 The tranquil surroundings of Vejer are ideal for yoga enthusiasts. Our course combines 20 Spanish and 3 yoga sessions each week. As yoga lessons are taken with the local yoga group, this is also a great way to meet local people and practice your language skills. For complete immersion in the Spanish language, we recommend host family accommodation. Meals will be provided by your host family, giving you the opportunity to try real Spanish cooking and you can choose between half board (2 meals each day) or full board (3 meals each day). Your host family will also provide a weekly laundry service. Alternatively, we can arrange accommodation for you sharing an apartment with other international students from the school, or in a private studio apartment. Both the shared apartment and studio apartment accommodation options are offered on a self-catering basis. All accommodation is within easy walking distance of the school. 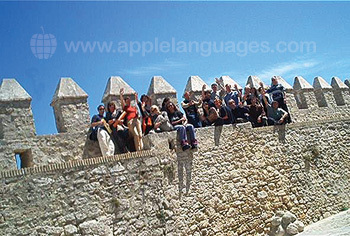 Our school in Vejer de la Frontera, like all our schools in Spain, organises an extensive cultural program. 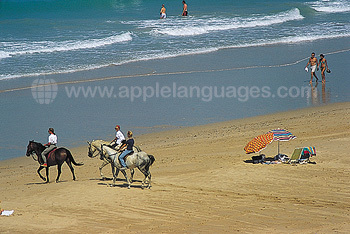 This program includes horseriding, beach trips, windsurfing, paragliding, scuba diving, snorkelling, as well as excursions to Cadiz, Seville, Cordoba and Morocco. There are also flamenco evenings in a local bar. These activities are great fun, as well as an ideal way to practice outside the classroom the Spanish that you learn on the course. 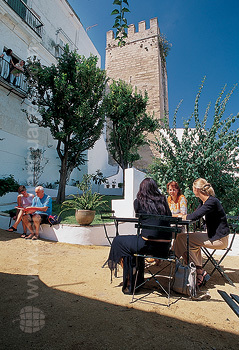 The closest airport to Vejer is Jerez, but students can also fly to Seville or Malaga Airports. Airports transfers are available to your accommodation on arrival. Average score for our school in Vejer de la Frontera based on 18 previous client reviews. The teachers were very attentive and caring. Super friendly and made my course very much joyous. Our profesora was empathetic and aware of weaknesses in our language learning that needed addressing. The classes were the right mixture of conversation and grammar and fun to boot! It was clear that Maria Jose enjoyed her job. My accommodation was conveniently near to our school, which was a bonus. Very kind hostess who made us welcome, introduced us to other members of the family and went out of her way to provide good food and talk as much as possible to us in Spanish, correcting us when necessary in a light-hearted way. Good accommodation for getting under the skin of the culture. We took advantage of a trip to a vineyard using the school's transport, and though interesting and enjoyable, we were a little disappointed not to be offered a small tasting of the wines produced. Good fun, lots of work but definatly worth it. I learnt a lot from the lessons and my teachers were very competent and friendly. It was extremely helpful staying with a Spanish speaking family and i think this aspect added a lot to the course. My family were very friendly and the accomodation very good. An excellent and well run course that was also fun. My teacher Eli was excellent and facilitated learning in a structured but enjoyable way. I learnt a lot in two weeks and gained confidence is speaking Spanish encouraged by Eli. 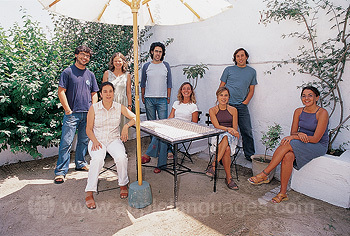 The family I stayed with were very accommodating and friendly and helpful with my Spanish practice. I was overall very pleased with my course and the organisation. It was great that I also had a lot of fun. The course was very good. The teachers were all very nice, helpful and professional. Vejer is the most gorgeous, friendly, welcoming place on earth. I have travelled a lot and I have rarely found a place that was so completely enchanting. So much so, that I extended my stay for an extra 2 weeks and it was VERY hard to leave! I can't praise Vejer, the locals, the College and the staff highly enough ... it was the holiday of a lifetime. The school has very good teachers, who are very intrested in helping you to learn to your best advantage.